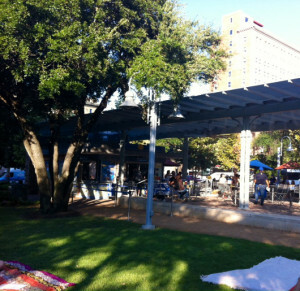 Bingo gets trendy at Market Square Park in Downtown Houston. On December 12, 2013, park visitors are encouraged to bring lawn chairs or blankets and enjoy a night filled with music, fun and bingo for a historic night out. And this Blanket Bingo is special… it’s the Tacky Sweater Edition! Attendees are encouraged to wear their tackiest sweater (think Bill Cosby) for an ugly sweater contest, enjoy a chance to win $500 cold, hard cash, and have an official photo taken with their four-legged friend under Texas’ largest mistletoe! General admission is $10 and includes a packet of bingo cards (approximately ten games) along with chances to win a number of great prizes. Participants are encouraged to spread out on the lawn or utilize the park’s existing tables during the game. All proceeds will help support local nonprofit Buffalo Bayou Partnership.